Ring in 2015 with these adorable champagne glass cookies from SweetAmb Cookies. This decorating tutorial shows you how to transform a plain sugar cookie into something festive to celebrate the new year. You can make these cut out cookies from your favorite sugar cookie recipe or bake up a batch of orange vanilla spice cookies like in the tutorial. It should be noted that while this is a fun foodie project, it is time consuming. These cookies should be made on a day where you can relax and enjoy the process. 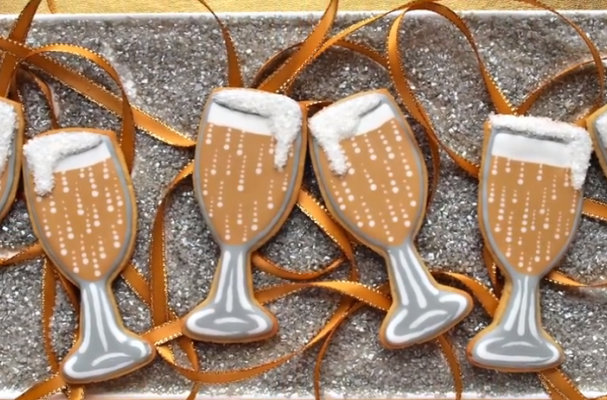 With that said, watch the video below to learn how to decorate these amazing champagne cookies in your own kitchen. Step 1: Beat all ingredients until icing forms peaks (7-10 minutes at low speed with a heavy-duty mixer, 10-12 minutes at high speed with a hand-held mixer). *Notes: Keep all utensils completely grease-free for proper icing consistency. **When using large countertop mixer or for stiffer icing, use 1 tablespoon less water. Thinned Royal Icing: To thin for pouring, add 1 teaspoon water per cup of royal icing. Use grease-free spoon or spatula to stir slowly. Add 1/2 teaspoon water at a time until you reach proper consistency.